If you have a client or an entity for or against which you frequently initiate actions it would save time and reduce errors to save the party name and address information. 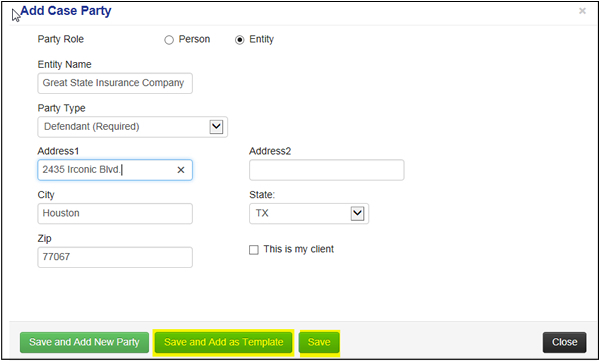 This would enable your firm filers to use the saved info instead of having to manual enter it for each new case. That is what the FileTime Case Party Template feature enables and this is how to use it. You can also save a Case Party Template while entering a case party as you will see further down. From Workspace on the top navigation menu, click the Templates button on the sub-menu. Then click the Case Party Template button on the drop-down menu. Initially you will see no templates on the Case Party Templates page. However, from this page you can add new case party templates, edit any case party templates you have created, and delete them as necessary. Be sure to click the Save Changes button if you make any changes to a template. Click the Add Case Party Template button to start a new page. Complete the ensuing Case Party Template page and save it to complete the template creating process. When you are entering case parties information during the submission process any templates you, or other firm members, have created will be accessible to you. In this example, we entered the first few letters of the case party template name: Great State Insurance Company. FileTime presents the template option to you... just click on the name of the template. The name and address information for the case party template automatically populate the Add Case Party page for you. If you need to enter another party click the Save and Add New Party button. Click the Save and Add as Template button if you did not use a template for this case party but want to save it as a new template. Click the Save button if you are finished adding case parties.